Songs of Eretz Poetry Review is pleased to present “The Bone Cutter’s Lament” by James Frederick William Rowe. Mr. Rowe is an author and poet out of Brooklyn, New York, with works appearing in Heroic Fantasy Quarterly, Big Pulp, Tales of the Talisman, Bete Noire, and Andromeda Spaceways Inflight Magazine in addition to frequent appearances in the Songs of Eretz venues. He is pursuing a Ph.D. in philosophy, is an adjunct professor in the CUNY system, and works in a variety of freelance positions. Contact him at http://jamesfwrowe.wordpress.com. In the bone I have removed? What weight in bone have I attained? Is it enough to fill a man? Poet’s Notes: About a year before I wrote the poem, I found myself curious one night as to why it was that amputations were historically performed with a bone saw, a horrible implement of human suffering, compared to what I thought a far more humane employment of an axe, sword, or any other sharp tool that may have severed the limb quickly and with far less pain. After only a little bit of research, I came upon a 19th century American doctor's writings on the subject of amputation, who revealed the rationale for the use of the saw had a sound, medical reason, in the formation of a post-operative stump. Without the use of a bone saw, the bone would not be cut smoothly, and if the cut were not made several inches higher than the damage, which entailed sacrificing much healthy bone, the excess skin and muscle could not be folded over the leg in order to provide a stump. 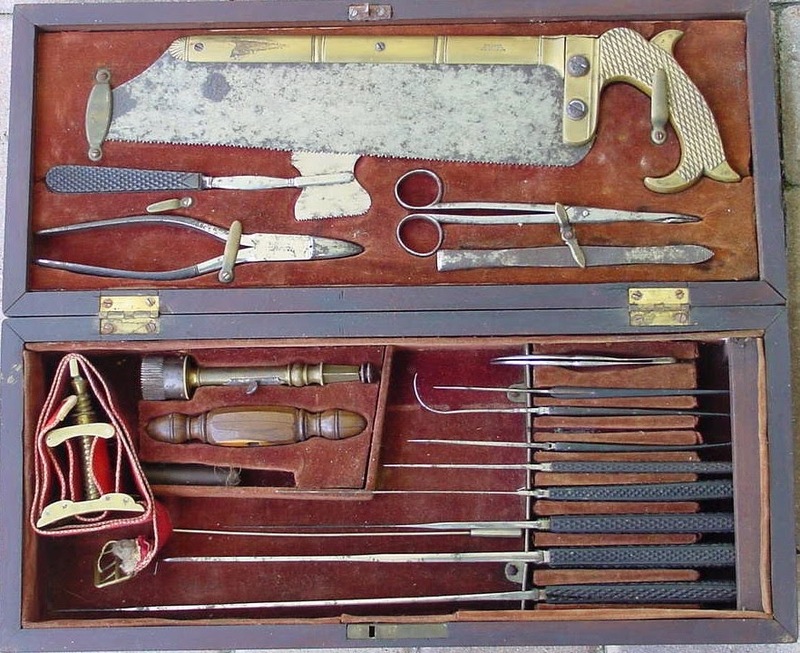 Far from being a mere exercise in medical cruelty, the bone saw provided the only hope a man would have to be able to use the limb for any purpose afterwards. It was the detail of wasting bone, through the cutting much higher than the damage that stuck with me the most. Though I'm not a doctor, I could only imagine that any man who has dedicated his life to healing others must have felt so aggrieved by the fact that he had to harm his patients even more in order to help them—that he "must discard more than God has taken." When the subject came back to me rather randomly one day, it was the return to this line of thought that proved to be the spark of inspiration needed for a poem that came easily to me—I wrote the whole thing in less than a day—and which served as the foundation for its theme of regret over this sad necessity of his surgical amputations. The overall form of the poem came naturally to me as the words formed in my mind. The only aspects that required significant work were the parenthetical asides that are featured once in every stanza. I had used this style once before in another poem, and I thought their introduction to this poem would add something to the aesthetics of the piece by changing the rhythm up and splitting the stanzas. Editor’s Note: As a medical doctor, I can personally attest that Mr. Rowe has captured the conflicting feelings that accompany the agonizing decision to “waste” healthy tissue in order to achieve a better overall surgical outcome. "The Bone Cutter's Lament" first appeared in the November 2013 issue of Songs of Eretz Poetry E-zine.